Dealing With An Unreliable Opener? A door opener is a very convenient feature to have in your home. But how do you know when it needs to be replaced, and which type is best for you, anyway? Here are few things to understand about the most popular garage door opener types along with a few tips to know when you might need to install a new one. Our company can install a wide variety of overhead door openers from all the well-known market leaders like LiftMaster, Craftsman, Genie and more. Although there are a lot of models available to choose from, they all use one of four different drive-systems. Each type has distinct advantages, and understanding what those are will help you make a more informed decision. Devices of this type operate with a chain attached to a trolley that runs along a rail. On the other end, the chain is attached to the motor unit that generates the required horsepower to open and close the garage door. Modern chain drive openers usually have DC motors that make their noise levels much lower than it used to be. They are still quite loud, though, which is why a homeowner with an attached garage may want to opt for a more silent type. These units work the same way as chain drive models, but with a belt instead of a chain. Belt drive openers cost slightly more than chain drive units but they are extremely quiet, and therefore they can be a perfect choice for many homeowners who want to avoid a lot of noise output. 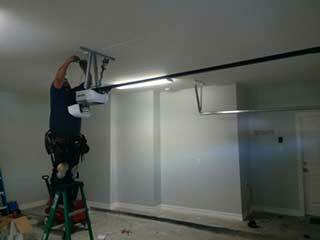 These units have a powerful motor that adjusts the torsion spring to raise and lower your garage door. Jackshaft openers can be mounted on your garage wall (which saves ceiling space) connected to the shaft on which the spring is installed. The usually have an ultra-quiet DC motor, and can be Ideal for homes with attached garages, or bedrooms above the garage. Screw drive-systems are similar to chain and belt drive models, but use a threaded steel rod to move the trolley. Due to issues involving temperature sensitivity and higher noise levels, screw drive openers tend to be less popular. Their main advantage is their speed and the fact that they require less maintenance than their counterparts. Perhaps your existing door opener is over ten years old. Maybe you're experiencing ongoing mechanical issues or the drive mechanism is too noisy. You might even be worried that the unit is no longer functioning safely, or it could just be that your garage door opener lacks modern features and you want to get an upgrade. These are some of the most common reasons why getting a new unit is a good idea. If you're experiencing one or more of the above issues, it's probably time to give some serious thought to the installation of a new opener for your overhead door. Call our experts at Garage Door Repair Coral Springs today and learn more about which type of drive system is best for you, and how our expert technicians can help with any opener repairs you may require.